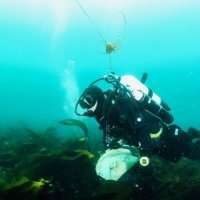 However the scientists also found that the ability of kelp forests to mitigate the harmful affects of climate change was hampered by the warming of waters across the globe by up to three times, which they say is cause for concern. Lead author Albert Pessarrodona from UWA's Oceans Institute and the School of Biological Sciences said the research was centred around what happened to greenhouse gasses emitted as a result of burning fossil fuels. "So far, the oceans have captured around 40 per cent of the carbon dioxide emitted by humans, so figuring out how carbon moves through that system is hugely important," Mr Pessarrodona said. Kelp forests occur in cold, nutrient-rich water and are among the most productive ecosystems on Earth, absorbing vast amounts of carbon dioxide in order to grow. "That carbon can then be channeled into habitats where it is locked away from the atmosphere (carbon sinks), playing an important role in mitigating the effects of global warming," Mr Pessarrodona said. The study has been published in Global Change Biology. "What is really concerning though, is that kelp forests living in warmer waters contain on average three times less carbon than those living in colder waters. "This suggests that future ocean warming will decrease the capacity of kelp forests to absorb carbon, particularly in areas where forests are already under stress from warmer temperatures, such as Portugal or the Australian mid-West." The scientists studied kelp forests from Norway to Portugal and in eight locations spanning 900 kilometres along the coast of Great Britain. "The study comes as the debate of how we manage coastal ecosystems to tackle climate change intensifies, and our results suggest kelp forests have a more important role to play than previously thought," Mr Pessarrodona said.